Similar to September 11, I know exactly what I was doing when the news item flashed across my phone screen about the marathon bombing. (I was purchasing an electric scooter for my son’s birthday at Toys“R”Us.) Within minutes, I emailed Julie Smolyansky, CEO of Lifeway Foods, the largest kefir manufacturer in the U.S., as I wanted to make sure she (runner) and her family (spectators) were safe. They were, thankfully. Running and kefir go hand-in-hand in my eyes, as Lifeway started much of its grassroots marketing through support of the running community by offering kefir at the finish lines for most major races. Lifeway is on the right track with promoting the health benefits of its products. The company has long been a leader in the cultured probiotic dairy movement and continues to invest in promoting the probiotic component of its products. When Julie’s father—Michael—came to America, he brought with him his family’s Russian recipe for kefir. I’ll never forget the first time I met Julie…about 18 years ago, but who is counting! Lifeway’s original factory was just a few miles away from my office near O’Hare, and her dad sent her with samples of a new product for me to taste. Julie continues to build on her father’s recipe. She has modified that recipe over the years to incorporate advancements in nutritional science, such as the inclusion of superfruits, various nutrients and probiotics. Lifeway Kefir contains seven to 10 billion colony-forming-units of 10 strains of bacteria, plus ProBoost, Lifeway’s exclusive pair (Bifidobacterium lactis and Lactobacillus reuteri) of clinically proven probiotics that helps balance the body’s ecosystem, and supports digestive health and immunity. For more information on the probiotics in Lifeway Foods, visit HERE. Others in cultured dairy need to get back on track with probiotics. That takes us back to Boston, where many leaders in cultured dairy convened this past Wednesday for the first Global Summit on the Health Effects of Yogurt, sponsored by the American Society for Nutrition (ASN) and the Danone Institute International. The U.S.-based Dairy Research Institute, established under the leadership of U.S. dairy farmers, was also a partner in this first global summit. The intent of this collaboration is to create an ongoing evaluation of the state of the science surrounding the relationship between yogurt consumption and health. This, of course, includes probiotics. This first global summit in Boston focused on the impact of yogurt and dairy consumption on health outcomes and health care costs, particularly related to chronic health conditions. The event featured leading international experts in medicine and nutrition science. The summit was packed with information, including a discussion on the impact of regular yogurt consumption on nutrient deficiencies, body weight regulation, chronic health conditions and related health-care costs. Speakers discussed how the industry can leverage the unique nutrient profile of yogurt, as compared to other better-for-you foods, including other dairy foods. The group also discussed opportunities for innovation and areas for future research. If you were unable to attend, the good news is that the summit was recorded and will be made available in the near future at www.nutrition.org. (I will let you know when it becomes available, as it is very informative.) Pending editorial acceptance, a peer-reviewed journal supplement will also feature review articles and summaries of the presentations. In the mean time, Mary Ellen Sanders, a global authority on probiotics, and co-moderator of the summit’s session on yogurt and gut health, explains that during the past two decades or so, the probiotic field has seen steady progress toward understanding that not all probiotics are the same. “Early on, ‘probiotic’ was used as a general term, a usage that masked that it comprises numerous genera, species and strains,” she says. “In time, however, ‘strain-specificity of health effects’ became the mantra of the probiotic field. “Even the European Food Safety Authority, the purveyor of probiotic criticism that has led to the word ‘probiotic’ being pulled off much of the European market, approved a non-strain-specific claim that yogurt cultures can improve lactose digestion in lactose intolerant people,” says Sanders. To read more from Mary Ellen Sanders, visit HERE. Lifeway Foods has made kefir shelf stable by freeze drying it, a process that preserves the live and active probiotic cultures. 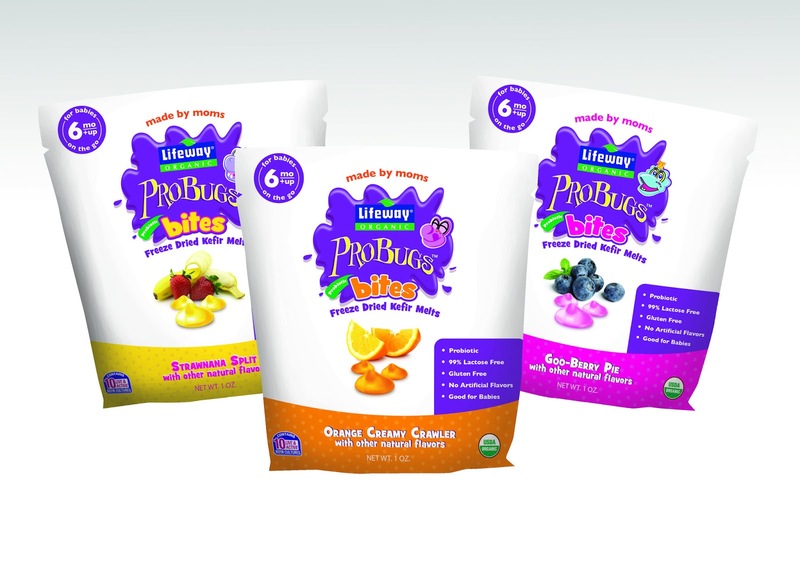 New Lifeway ProBugs Bites are tiny freeze-dried kefir melts that quickly dissolve in baby’s mouth for safe and easy self-feeding. Flavors are: Orange Creamy Crawler, Goo-Berry Pie and Strawnana Split flavors. 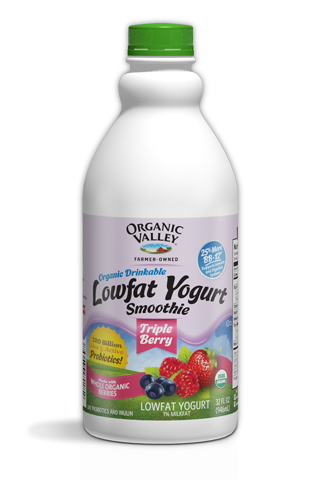 Organic Valley’s new and improved Drinkable Lowfat Yogurt comes in three varieties: Plain, Triple Berry and Vanilla Bean. The product is made with organic milk from the co-op’s pastured cows and cultured with 320 billion live and active probiotic cultures. That’s 32 times more probiotics than most kefirs, according to the company. Labels tout the fact that the product specifically contains 25% more of the BB-12 strain (as compared to the original drinkable yogurt formula). 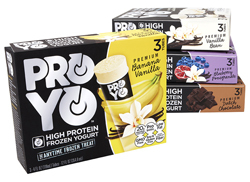 ProYo Frozen Yogurt is described as an “anytime frozen treat.” Each 4-ounce squeeze tube contains 20 grams of milk protein, live active probiotic cultures, added fiber and only 160 calories. It comes in four varieties: Banana Vanilla, Blueberry Pomegranate, Dutch Chocolate and Vanilla Bean. For more information, visit HERE. Heini’s Greek Yogurt Cheese includes real Greek yogurt that is added to the cheese vat. Sold in 8-ounce chunks, a 1-ounce serving contains 100 calories, 8 grams of fat and 6 grams of protein. Package claims include: Probiotic with live yogurt cultures. The Hain Celestial Group Inc., extends The Greek Gods brand to drinkable Kefir low-fat cultured milk. It comes in four flavors: Plain, Honey, Honey Vanilla and Honey Strawberry. A one-cup serving delivers 12 grams of protein and probiotic cultures. It is also gluten free and 99% lactose free. For more information, visit HERE. The Dole Fruit Smoothie Shaker product uses a convenient and attractive single-serve container to provide consumers the opportunity to make a homemade, hand-blended smoothie. The product contains both frozen fruit and yogurt. Simply unscrew the cap, add juice to the fill line, re-apply the cap and shake for about 30 to 45 seconds. The result is a perfectly blended smoothie, just like from the local smoothie shop. Each low-fat smoothie contains real yogurt with live and active cultures, including probiotics, as well as prebiotic fiber. For more information, visit HERE. This product is non-dairy, but definitely worth noting. 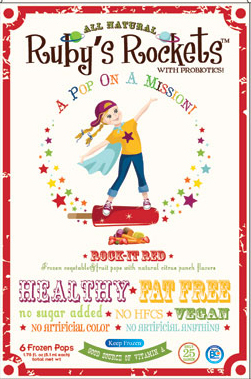 Ruby’s Rockets are frozen fruit and vegetable pops designed for kids. These all-natural ice pops are a fun, convenient, healthy low-calorie snack containing probiotics. There are three varieties: Rocket Red (sweet potatoes, strawberries, carrots and beets with a fruit punch flavor), Galaxy Green (avocados, kiwis, spinach and apples with a tropical lime flavor) and Orbit Orange (sweet potatoes, carrots, oranges and lemon with an orange flavor). For more information, visit HERE. Another innovative non-dairy option is KeVita Daily Cleanse, a low-calorie, low-glycemic beverage designed for cleansing the body. Lightly sweetened with stevia, it has only 10 calories and two grams of sugar per bottle. Organic lemon and a hint of cayenne create a hydrating refreshment that may help to curb cravings for snacks and sugary drinks, according to the company. All KeVita drinks feature four complementary strains of probiotics--Bacillus coagulans, Lactobacillus paracasei, Lactobacillus plantarum and Lactobacillus rhamnosus--combined with KeVita’s signature and proprietary probiotic culture. And in case you missed two products featured earlier this week as a Daily Dose of Dairy, here you go. 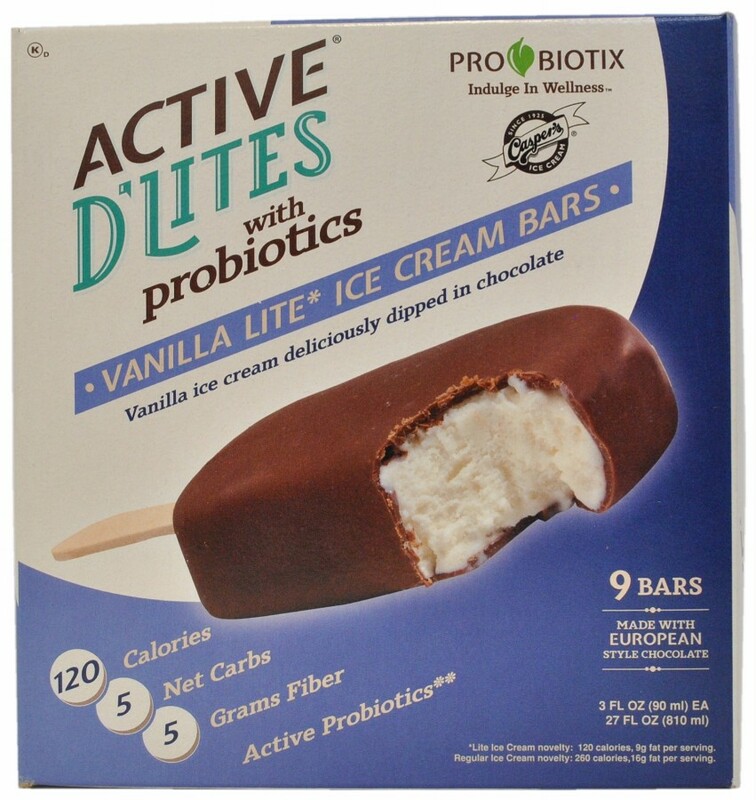 Casper’s Active D’Lites with Probiotics Lite Ice Cream comes in three flavors: Almond, Caramel and Vanilla. Each single-serve bar delivers 110 to 140 calories, 8 to 11 grams of fat, 5 grams of fiber and 3 to 4 grams of protein, depending on variety. The fibers, which function as prebiotics, are digestive resistant maltodextrin, fructooligosaccharides and inulin. Ingredient statements state that at the time of manufacture, each bar contained 10 billion colony-forming-units of probiotics. 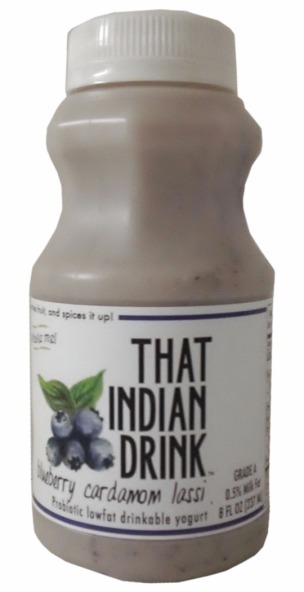 That Indian Drink is a new line of chef-crafted lassi that comes in three creative flavor combinations: Alphonso Mango (contains the essence of rose water), Blueberry Cardamom and Raspberry Cinnamon (contains a hint of ginger). The drinks come in 8-ounce plastic bottles, with each containing 130 to 150 calories and 2 to 2.5 grams of fat, depending on variety. Each bottle also delivers more than a full serving of fruit, probiotics, 7 grams of protein and 1 gram of fiber (from the fruit). Warmer weather and longer days motivated me to make my first trip of the season to Home Depot’s Garden Center. 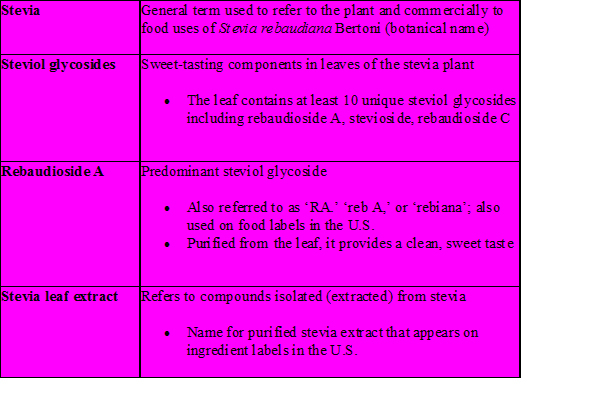 And like last year, stevia plants were for sale. Of course, I had to ask how they are selling, and the clerk assured me they are a hit. With reb-A being one of about a dozen sweet-tasting compounds in the stevia plant, suppliers are differentiating themselves by reb-A content, as up to 5% of a stevia-based sweetener can be something other than reb-A. 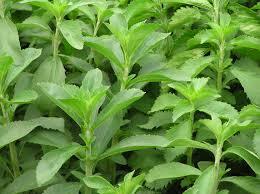 Most of the zero-calorie stevia-based sweeteners are 200 to 300 times sweeter than sugar. Quark by elli is a fresh, German-style soft cheese, similar to cottage cheese but with a smoother and creamier texture, and offering a milder taste than Greek yogurt. elli answers a growing need for an all-natural, nutrient-dense source of protein and calcium, without the added sodium found in cottage cheese or high-sugar content of some yogurts. Each single-serve 5.3-ounce cup contains 14 to 17 grams of protein and 80 to 90 calories, depending on variety. Sweetened with a proprietary blend of stevia and erythritol, the company is able to keep calories low, as well as sugars (5 grams) and carbohydrates (less than 10 grams). elli can be enjoyed straight out of the cup or be used as an ingredient to create sweet and savory recipes that often call for cottage cheese, cream cheese, ranch dressing or yogurt. It comes in five varieties: Lemon, Pineapple, Plain, Red Velvet and Strawberry. 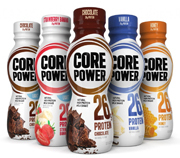 Core Power is produced and marketed by Fair Oaks Farms Brands Inc., using fresh, quality real milk that undergoes a unique cold-filtration process. This yields fresh milk with increased amounts of protein in the same ratio naturally found in milk: 20% whey and 80% casein. This recovery beverage is sold in 11.5-ounce recyclable plastic bottles and is aseptically packaged so it can be distributed in a shelf-stable environment until chilled before consumption. There are two light varieties: Chocolate and Strawberry Banana Light. Both are sweetened with a touch of honey (like all of the regular varieties). Calories and sugar contents are kept low through the use of monk fruit juice concentrate and stevia leaf extract. The light versions contain 20 grams of protein per 11.5-ounce bottle, while the others, which come in Chocolate, Honey and Vanilla flavors, contain 26 grams of protein. For more information, visit HERE. Yakult U.S.A. Inc., now offers Americans a lower-calorie version of its probiotic shot-style namesake drink. Yakult Light has almost two-thirds less sugar than regular Yakult as a result of being sweetened with only a small amount of sugar and a stevia-derived sweetener. It contains 30 calories per 2.7-ounce bottle, while the original contains 50 calories. For more information, visit HERE. Powerful Yogurt is a super-protein Greek yogurt that aims to serve the health and performance needs of busy men with active lifestyles. The product is differentiated from existing Greek yogurts by its 20 to 25 grams of natural protein per serving, which is a “man-sized” 8-ounce container that is at least 33% larger than most individual-serving Greek yogurts. To keep sugars down to 21 to 23 grams per serving in the fruited varieties, the company uses a combination of sugar and a stevia-derived sweetener. The product comes in six flavors: Apple Cinnamon, Banana, Blueberry Acai, Mango, Plain and Strawberry. For more information, visit HERE. FitPro uses ultrafiltration to concentrate the protein in this REAL milk beverage. There are two formulations, both of which come in chocolate and vanilla flavors. The 17-ounce FitPro Plus is designed for athletes and workout enthusiasts. It contains 40 grams of protein, 10 grams of carbohydrates and 250 calories. The 11-ounce FitPro Daily is for active individuals. It contains 26 grams of protein, 8 grams of carbohydrates and 160 calories. The company keeps carbs and calories low by filtering out the lactose while it concentrates the whey and casein proteins, as well as by sweetening with a blend of stevia and monk fruit extract. 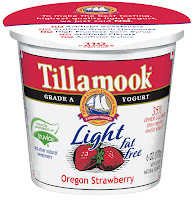 Tillamook was the first light yogurt brand to offer a product naturally sweetened with Truvia® sweetener and other natural sugar substitutes.Product containers sport the Truvia logo. 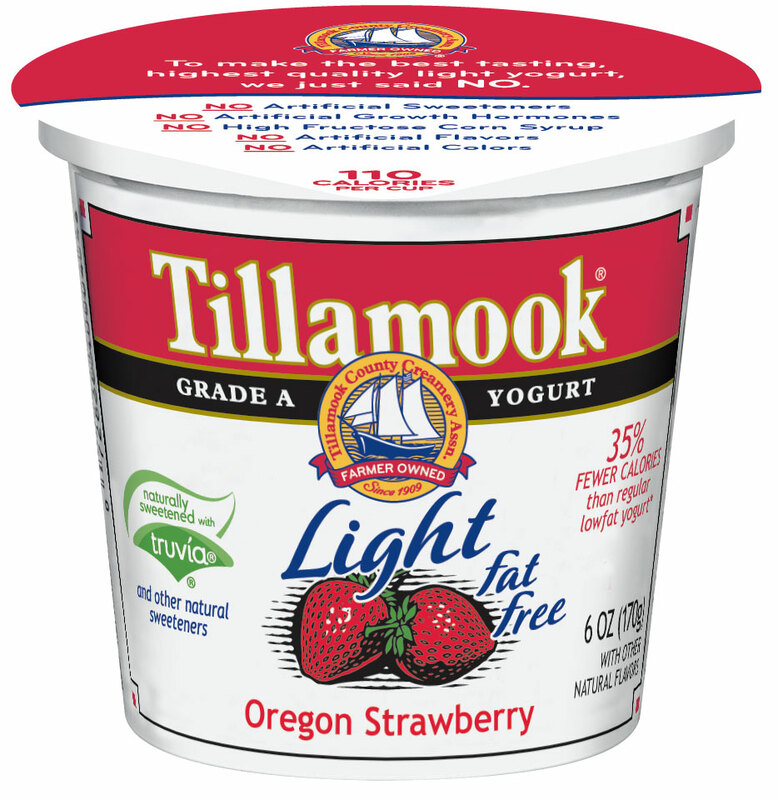 The 6-ounce yogurt cups contain only 110 calories per serving, 35% less than regular low-fat yogurt. The full line consists of Oregon Strawberry, Vanilla Bean, Marionberry, Raspberry, Peach, Mountain Huckleberry, Northwest Berry Patch, Pomegranate Blackberry, Lemon Squeeze and Dark Cherry. ITO EN now markets Teas’ Tea Plus half & HALF. 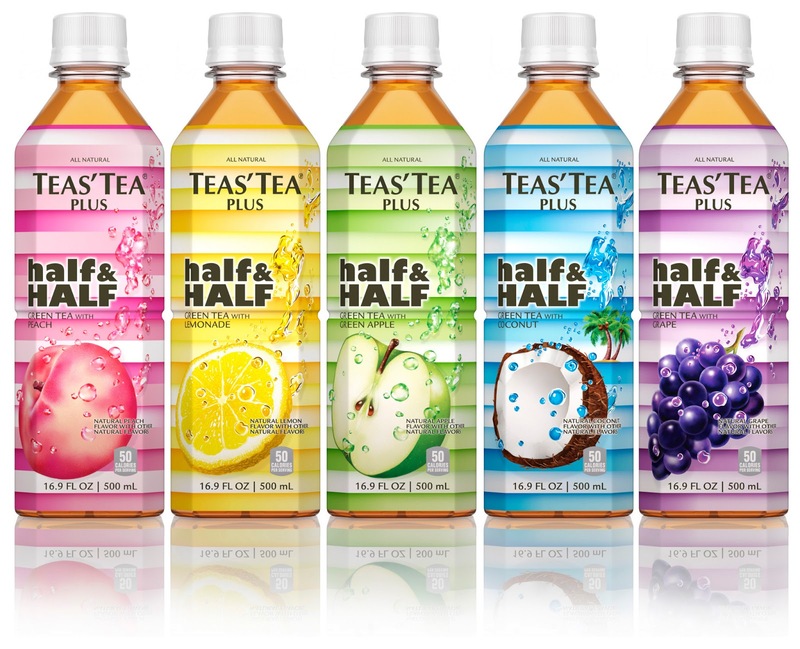 This ready-to-drink tea beverage line is made from fresh-brewed green tea that is infused with fruits juices and other flavors. Varieties are: Coconut Water, Grape, Green Apple, Lemonade and Peach. Each 16.9-ounce square plastic bottle contains two servings, with each serving providing 50 calories. The drink is slightly sweetened with cane sugar and a touch of stevia. For more information, visit HERE. Casper’s Active D’Lites with Probiotics Lite Ice Cream will be featured this coming week as a Daily Dose of Dairy. Stevia-based sweetener is used in both the ice cream and the chocolate coating. Watch for more information this coming week. Dairy Innovation Awards 2013: Get Global Recognition. Enter Today! Please pardon this deviation from my typical industry trends/issues blog. It’s been a long week of travel to Salem, Oregon, to speak on dairy innovations at the 102nd Oregon Dairy Industries Annual Conference. It was wonderful to see so many processors and suppliers at the show. If you missed this year’s event, consider attending next year. Right now you should plan on entering a global dairy products innovation contest—the leading new dairy products contest in the world. United Kingdom-based FoodBev Media has organized and presented the Dairy Innovation Awards every year since 2007. Finalists and winners in Dairy Innovation Awards 2013 will be presented at a special gala dinner during the 7th Global Dairy Congress in Lucerne, Switzerland, on June 19, 2013. For more information on the congress, visit HERE. A showcase magazine featuring all entries will be available at the event and circulated to all readers of the print and digital editions of Dairy Innovation magazine. Check out the publication HERE. The contest is open to products and campaigns launched since April 1, 2012. The closing date for entries is April 23, 2013. Entry information is available HERE. I am honored to be one of the 12 dairy industry authorities who will select the winning innovations. The only other U.S. judge is Greg Miller, president of the Dairy Research Institute and executive vice president of the National Dairy Council. Miller and I go back more than 20 years when we both were product innovators at Kraft Foods. Hence, our passion for dairy innovation runs deep. Bill Bruce, group editorial director with FoodBev Media and chair of the contest, believes innovation is the future for dairy. I agree. “Innovation continues to be the key driver in the dairy industry and that is evident in tasty new products, new packaging ideas, use of new ingredients, great new marketing campaigns and a huge variety of nutrition and environmental projects that interact with consumers and the wider community,” he says. 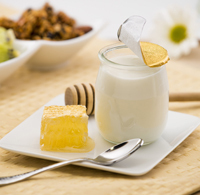 “All this activity helps to make the dairy sector an exciting food and beverage category. Here are the contest’s categories. On the heels of participating in the 15th annual Dairy Council of California Functional Foods Task Force (DCC-FFTF), I would like to share comments made by fellow task force member Cary Frye, vice president of regulatory and scientific affairs at the International Dairy Foods Association (IDFA). You can read more about the DCC-FFTF by clicking HERE. 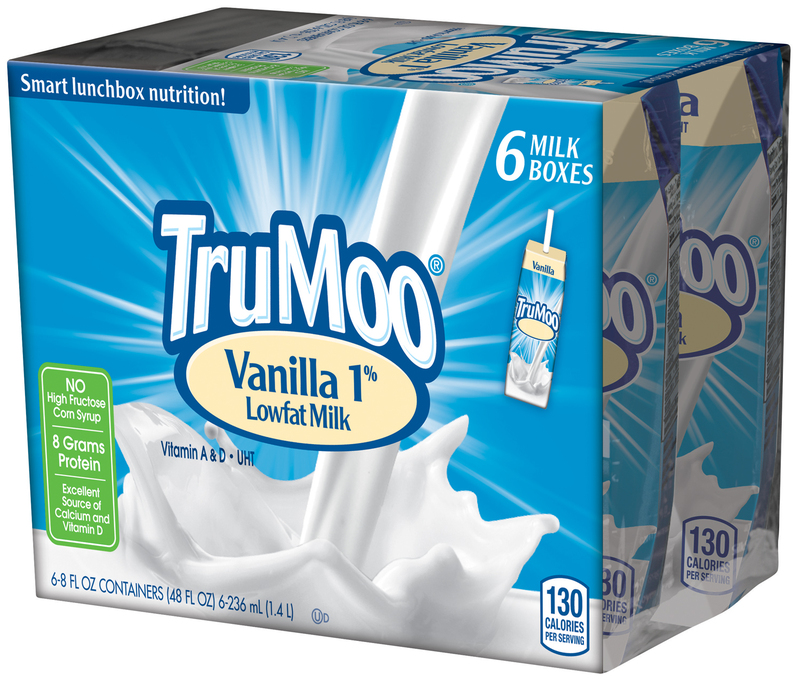 This school variety of TruMoo contains only 120 calories per serving and 6 grams of added sugar. To read more about TruMoo and other innovative new milk products, click HERE. With his milk, he had French toast…with sugar-free syrup. We choose sugar-free products (those sweetened with non-nutritive sweeteners) to limit daily sugar intake, as diabetes does run in the family. Further, we also try to limit caloric intake from sugars to prevent unnecessary weight gain. Imagine how overweight and/or diabetes-prone children would benefit from flavored milk that contains even fewer calories and less sugar than TruMoo or similar milks. Nearly four years ago, IDFA and the National Milk Producers Federation filed a citizen’s petition with FDA requesting a modification of the standards for milk and other dairy products to allow the use of non-nutritive sweeteners. In February 2013, FDA finally published the petition in the Federal Register along with the agency’s request for public comment. 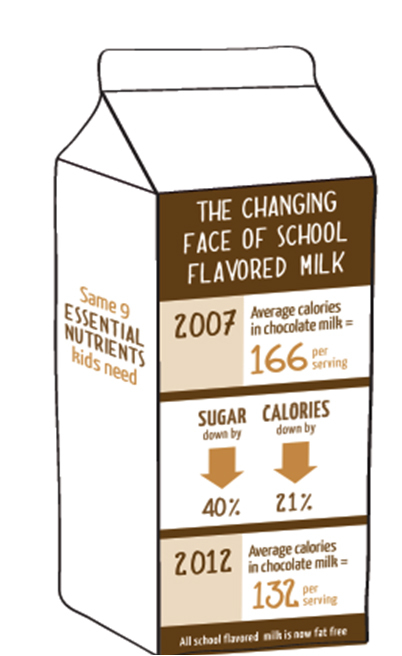 The petition was and continues to be a direct attempt to keep flavored milks in school cafeterias, as federal agencies and consumer groups continue to push for lower-calorie milk and foods on school menus to combat increases in childhood obesity. Allowing milk processors to use any “safe and suitable” sweetener in flavored milk and still label it “milk” would help to stem the drop in consumption, while promoting healthy eating habits that will last a lifetime, according to the petition. “Milk flavored with non-nutritive sweetener promotes public health by offering children and adolescents a beverage they are more likely to consume than plain milk and that has all of the nutritional benefits of milk and less sugar than milk flavored with nutritive sweeteners,” the petition states. The petition and supporting attachments are available HERE. To post comments on FDA’s web site about the petition, link HERE. 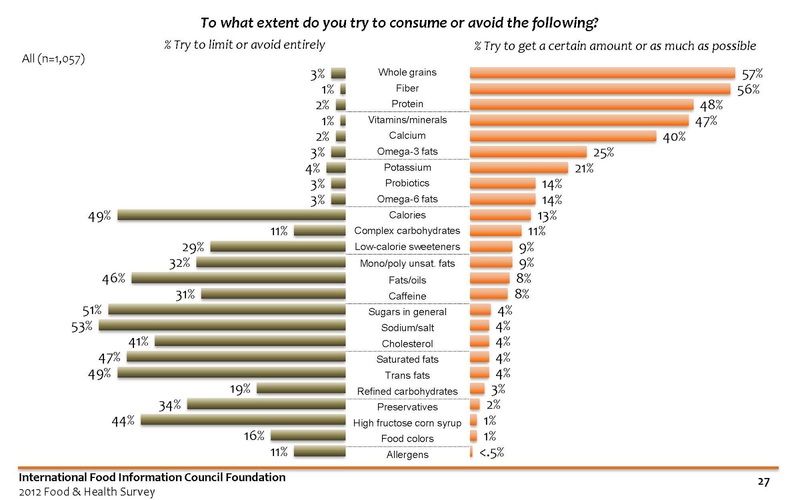 FDA’s food labeling regulations require all food products that use non-nutritive (or non-caloric) sweeteners to clearly list them in the ingredients list on their packaging. This petition would not change that, and consumers would continue to see at a glance whether or not a product contains sweeteners of this sort. Frye recently appeared on The Dr. Oz Show, a nationally syndicated daytime television program, to present the industry’s position and reassure consumers that all dairy products would continue to communicate ingredients clearly on the ingredients label. 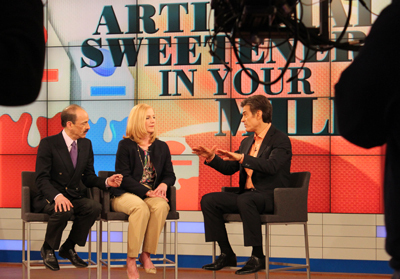 In her interview with Oz, the show’s host, Frye stressed that the petition would only affect sweetened dairy products and that sweeteners would not be added to white milk. 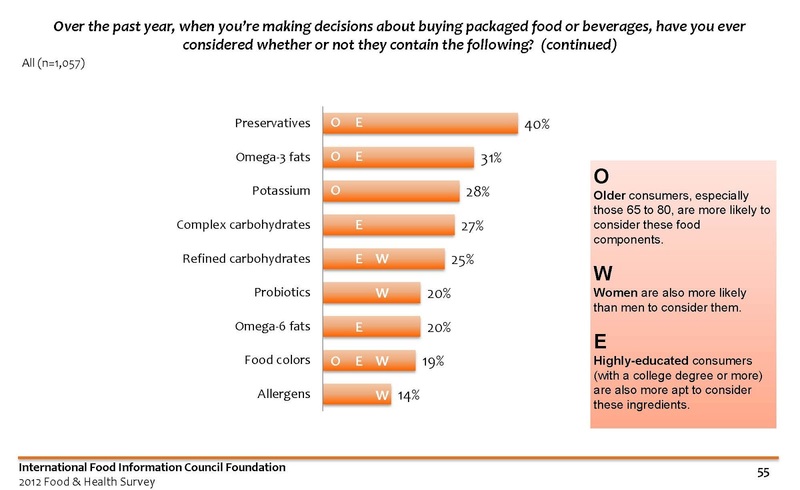 She explained that all ingredients would still be listed on the label and that the petition is asking for flexibility to provide consumers with low-calorie or no-calorie options. “We want to be able to compete with other beverages such as low-calorie sports drinks and diet sodas that have the exact same labeling that we’re asking for,” Frye said. She was joined by Dr. Keith Ayoob, R.D., an associate clinical professor of pediatrics at the Albert Einstein College of Medicine in New York City. Ayoob pointed out that non-nutritive sweeteners are safe and that most Americans aren’t getting enough of the nutrients provided by milk and dairy products. He also reinforced that the petition would allow additional options for consumers. Oz also interviewed two guests who opposed the petition: Dr. Russell Greenfield, clinical assistant professor of medicine at the University of North Carolina Chapel Hill School of Medicine, and Heather White, executive director of the Environmental Working Group. Overall, Oz underscores several times throughout the show that he is a supporter of milk, its wholesomeness and its numerous health/nutrition benefits. His main concerns are transparency/lack of front-of-pack labeling on the industry’s behalf, added “chemicals” and the consumer’s right to know what’s in their products. The segment never questions the nutrition benefits of milk nor that it should be removed from the diet. In fact, it’s quite the opposite, reinforcing the wholesomeness throughout--but Oz is very dramatic about labeling, urging consumers to sign the petition to keep wholesome/nutritious food unadulterated. ...Al Capone, an inmate (#85, to be specific) at San Fran’s famous Alcatraz high-security prison, lobbied for milk-bottle dating to ensure the safety of Chicago’s (my hometown) children. That's right. Prior to being sent to "The Rock," Capone was a Chicago businessman who made a fortune in alcohol distribution during the brief period of Prohibition from 1920 to 1933. Although the Federal government viewed Capone as a gangster, to many people in The Windy City, he was a modern-day Robin Hood, as he was the first person to open a soup kitchen to feed the poor during the Depression. It gets better. It was reported that one of Capone’s family members in Chicago became ill from drinking expired milk. At that time, there were no controls on milk production, neither expiration dates nor controls on adulteration, dilution or skimming of the cream. This drew Capone’s interest to the milk business. Here’s where the scandal begins. With the end of Prohibition approaching, Capone saw a potentially high profit in milk distribution, as his fleet of “moonshine” trucks could easily be used to transport milk. So, first, he acquired a milk processor: Meadowmoor Dairies. Then he made history in the U.S. dairy industry, but something very few know: Capone convinced the Chicago City Council to pass a law requiring a visible date stamped on milk containers. Of course, he most likely had other motives. Many believe that Capone had already cornered the market on equipment to stamp expiration dates on bottles, and the passage of the legislation would help him take over the Chicago milk market. Too much information. I know. 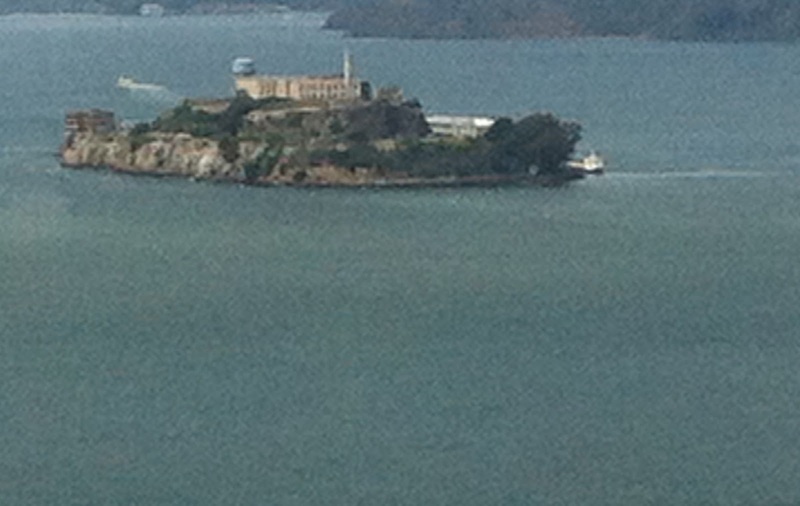 Oh, wait...Alcatraz inmates were served two milks at each meal.